Reproductive arrangements don't get much stranger than those of the Batura toad of Pakistan. The entire species is the result of two unknown species interbreeding, and each toad carries three sets of genes...which makes passing on its genome extremely tricky. 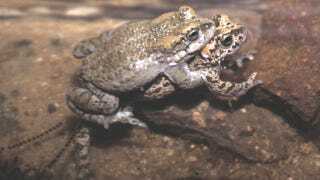 The batura toad is a rare example of a triploid animal, referring to their three sets of genes as opposed to the standard pair that the vast, vast majority of organisms possess. Being a triploid makes sexual reproduction next to impossible, because that requires splitting genes in half so that an offspring can be created with half of each parent's genome. But you can't divide three in half evenly, which means most triploid species are forced to start reproducing asexually, effectively cloning themselves. But batura toads have come up with a novel way around this. Of their three sets of chromosomes, two comprise a matching pair known together as NOR+, while the third set is NOR-. Researchers at Switzerland's University of Lausanne have discovered that NOR- is only passed on from the mother, and that the male's sperm contains only NOR+. This means that the NOR- chromosomes are transmitted asexually, making that part of the toad's genome essentially a clone. The NOR+, on the other hand, is only transmitted sexually, as the two parents recombine their NOR+ chromosomes to create a new set for their offspring. This means each batura toad is simultaneously the result of sexual and asexual reproduction. The researchers still don't exactly why the toads have developed this unique reproductive strategy, but it seems to have worked all right for hundreds of thousands of years. Unfortunately, it does appear to carry with it some pretty serious drawbacks. Because a third of their chromosomes have been cloned for all that time, it's likely that a number of harmful mutations have built up. Sexual reproduction has likely smoothed out any errors in the NOR+ chromosomes, but the NOR- could be fatally damaged. PNAS via New Scientist. Image by Matthias Stöck.